﻿ Best Western Plus Hotel Bahnhof Schaffhausen. JIMAT di Agoda.com! Hotel telah dibina pada 1895. Hotel telah dibaik pulih pada 2013. Hartanah ini terdiri daripada 45 bilik. Hotel terdiri daripada . Hotel ini merupakan tempat yang sesuai untuk meneroka kawasan. Tetamu boleh menyimpan barangan berharga dengan selamat di dalam peti keselamatan Hotel. Hotel menawarkan pengurupan mata wang untuk kemudahan tetamu. Akses lif disediakan kepada tetamu untuk kesenangan tambahan. Hotel menawarkan perkhidmatan bilik. Hotel menawarkan perkhidmatan dobi. Terdapat kedai dobi layan diri untuk penginapan jangka panjang. Tempat letak kereta selamat ada disediakan untuk keselamatan tetamu. Friendly staff that helped us with our check-in and check-out. Very convenient location. Hotel is just above the train station but still quiet, can’t get any nearer. City center location. Walking distance 10mins to IWC factory & museum. Rhine Fall is a short train away. Simple decor big room and very clean. Will stay again. I booked this hotel as I needed to be close to a customer site. the staff was very professional and received a very warm greeting. 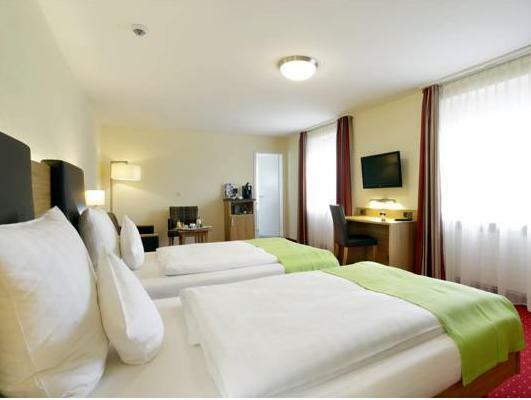 Rooms are excellent, clean, quiet and functional. Breakfast was exceptional. overall great experience and I would highly recommend this hotel for any travelers heading there in the future. The room is basic but comfortable. It is directly opposite the train station so tt's really convenient. The city centre is just a lane behind the hotel. Breakfast was a reasonable spread. 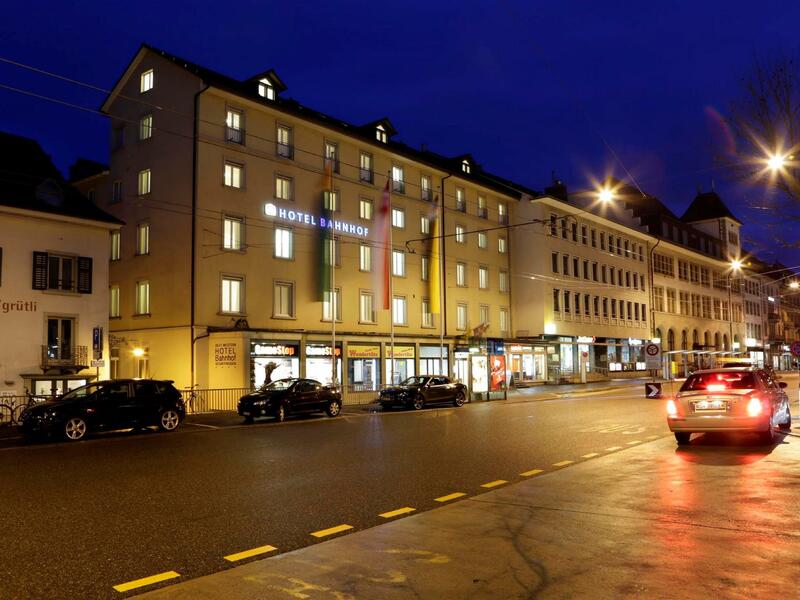 Ideally located right across the Schaffhausen Metro station. Free wifi as well. The main town square is located just right behind the hotel where a lot of shops and restaurants can be found. The tourist office is about a ten minute walk away. I suggest you visit it so you can get some travel tips and a map of Schaffhausen. They also have a boat load of souvenirs from magnets to shot glasses. wir waren zu dritt unterwegs und hell begeistert von der genialen gastfreundschaft des hotels! wir empfehlen es gerne weiter. War okay bis gut. Sauber und schönes Bad. Preis leistung stimmen nicht ganz. Einfache Zimmer zu dem teuren Preis, kein Wellness Bereich und Garage ist ein paa Minuten fußläufig entfernt. Und dafür, obwohl man 5-8 Minuten hinlaufen muss, werden noch einmal 15 franken fällig - das ist gepaart mit der Entfernung echt frech. 스위스 여행지 첫 숙소로 정한 곳이었습니다. 정말 역앞에서 가깝고 룸도 넓고 웰컴기프트까지 정말 세심한 배려가 좋았습니다. 조식도 다양한 음식들로 정말 행복했습니다. 무엇보다 친절한 직원들 덕분에 스위스 여행의 첫 시작이 매우 즐거워서 감사했습니다. 다시 스위스를 간다면 또 묵고 싶은 곳입니다.